Mailbag. Dave opens his mail and tears down a bunch of random stuff. 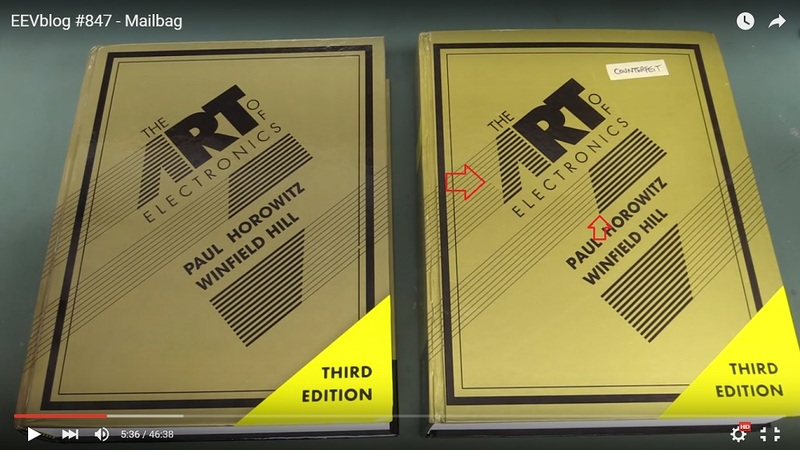 Counterfeit copies of Art Of Electronics! Nice close up shots, it's not blurred anymore. Nice. Great teardowns, great selection of objects, great to watch ! I noticed a funny thing on the chopper - dendrites! See attachment. I'd be very interested in seeing a comparison of the two USB scopes. I've given a bit of thought to replacing or at least supplementing my old CRT scope with a USB one, and seeing some of the various options compared would be helpful. I like my old CRO fine and all, but once in a while it would be really nice to have direct frequency or voltage readings, or be able to easily snag a graphic of output without trying to take a picture of the screen. yea, i saw that too... tin whiskers! There was a cap (or was that a MOV?) that looked like split in half in that Fluke multimeter. I'd be very interested in seeing a comparison of the two USB scopes. Are there any other directly competing ones? Not talking no-name ebay ones. Only thing I know about USB scopes is they have USB Its an area I've done precisely zero research on. I just find the notion of being able to see a display on my 32" LCD monitor with software analysis and data readings right on the screen to be interesting. I don't know if one would do for me though. I mess with tubes for audio and radio work mostly, so RF and high voltages would have to be something it does. Also it was fun watching Sagan learn the word Scam. In addition to making polygraghs, Grass Instruments has been a high quality maufacturer of nerve stimulators used in research and teaching labs since the 1960s. I recently bought one of their classic SD9 stimulators on eBay. It's fully isolated, so safe to use with human subjects. It has a well engineered modular design. Great mailbag. The Fluke 73/75/77 are great meters. My dad gave me a box full of mistreated and dodgy ones years ago. Usually a cleaning some Caig DeOxit on the switch and a new battery fixed them up. At one time it cost more to have them calibrated a few times than buying new meters so many tossed them and bought new. The only real problem is the zebra strip connection to the display. It appears that yours may have that problem. Just clean the strip and the display and the PCB to zebra connections with alcohol and put it back together and it will still be good until Sagen gets to college. If you put one of those 9V lithium batteries in the meter it will probably still be ready to use when he starts his first circuits lab around 2030 or so. Earlier if he skips a grade! Those meters were shipped with the carbon zinc 9V batteries IIRC. They would run the meter for 2000+ hours no problem. I think that is what I liked best about them as well as their phenomenal Fluke stability. Rare to see the CZ 9V battery leak. Alkalines do! I believe that lithiums do not. You can find them in the big box hardware stores as they are used for smoke and CO detectors. For the person that was asking about the slot in the MOV. This was standard practice to cut a slot to create a spark gap. That could be just a capacitor with a spark gap cut. These work to ground the zaps just like the old Frankenstein movies. The case screw design is called Plastite(R). It is a dual helix screw designed especially for plastics. A patented design that costs more than the average screw. The hint to keeping the threads in the plastic case is to drop the screw in and rotate it counter-clockwise ( it is CCW in Oz is it not?) until the screw drops into the thread, then turn clockwise to tighten. I do not remember having any units with stripped threads. However I have seen some with broken stops for the rotary switch. A cure for that is to pop the actuator off of the housing and use a pin vise to drill a small hole where the broken stop was. Then use the cut head off of a small finishing nail (you need to retain part of the shank) to create a new stop. Simply heat the pin with a soldering iron at a low temperature until it sinks into the plastic while guiding it into the hole. Once cooled you will have a new stop. Overall the 75/77 is one of the finest and simple meter designs out there. Something Sagan will appreciate when Dad is old and grey! Yes, please do a comparison of the Analog Discovery and the Red Pitaya - including the software! These are much more than just USB scopes as you know. Also - a side by side teardown comparison of the Analog Discovery 2 with the original AD if you still have it. I believe the only major hardware difference is the addition of the external power input to provide more power for the 5V power supply - but it would be good to see that confirmed - and see what other changes they may have made to the layout. I'd like to see a comparison between the Analog Discovery and the Red Pitaya also. I just bought the Red Pitaya fm Mouser but as it turns out the hardware is NOT open sourced, just the software. You can't get a schematic. I had one of the Sinclair Cambridge calculators in around '72 or '73. There were two versions, the regular four function one with an equals key and the 'Scientific' which had trig. functions and was RPN. Both came as either assembled and ready to go, or as a solder it yourself kit for a couple of pounds less. You can probably guess that I had the Scientific in kit form. You can probably guess that I had the Scientific in kit form. So did I. I felt quite a pang of nostalgia seeing one here. That was interesting. Thank you! Quote: "...it is a substitute for slide rules and mathematical tables." So while everybody else was trying to produce 8 or 10-digit accuracy, Sinclair was aiming at people who were used to working with slide rules and log tables. Smart move. The accuracy and limited range of the math functions wouldn't be a problem for those people and the price would be very attractive (50 pounds for the Sinclair instead of 300-400 pounds for HP/TI, according to some pages I've seen).